This catalogue accompanied an exhibition of the same name at the Nassau County Museum of Art in Roslyn Harbor, New York from February 7 to April 8, 1984. The exhibition was a retrospective of Johnson's collage work and was co-curated by Phyllis Stigliano and Janice Parente. 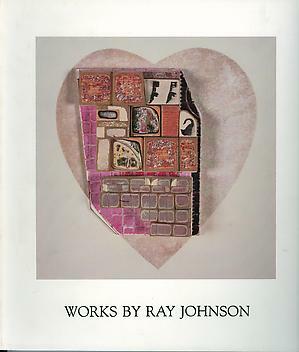 The catalogue includes the essay "Ray Johnson Collages: Valentines/Snakes/Movie Stars" by David Bourdon. Bourdon, David. Works by Ray Johnson. Roslyn Harbor, NY: Nassau County Museum of Fine Art, 1984.